Summer is in full swing – and so is the Occupational Safety and Health Administration’s (OSHA) Heat Illness Prevention Campaign. 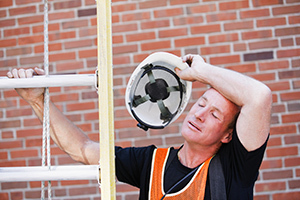 In early July, OSHA and the National Oceanic and Atmospheric Administration's (NOAA) National Weather Service held a news conference with weather professionals to help inform employers about the dangers of heat stress and ways to prevent them. One of the key issues highlighted in this conference was the need for temporary and new workers to be particularly careful when working in the heat. OSHA recommends increasing a new employee’s workload gradually. This allows workers’ bodies to properly adjust and develop heat tolerance. Help protect workers in hot weather by training them to understand risks, teaching the signs of heat-related illness, and providing heat stress relief products.